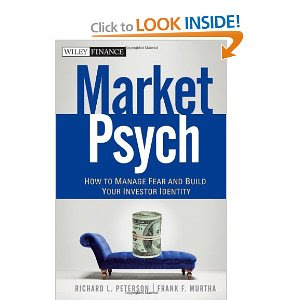 MarketPsych is proud to report that in Kiplinger's Personal Finance December issue, MarketPsych: How to Manage Fear and Build Your Investor Identity was honored as one of the Top 3 finance books for 2010. Top 3. And # 1 of its kind. We're right next to Michael Lewis's latest work. So if books had elbows, our's would be rubbing with those of some pretty darn good company. And though we can't promise that MarketPsych will be made into a major motion picture anytme soon (mainly because of Rich's bizarrely rigid insistence that he be played by George Clooney) - we can promise that if you read the book and engage in the exercises therein, you will a better, smarter investor. In fact, we don't consider it a book, as much as a (highly entertaining) psychological tool kit that builds the skill you need for long term wealth accumulation.